The increase is largely due to Icelandic shipping company Eimskip, which arrived in Portland in 2013. The Port of Portland, which lost its container business in the wake of the Great Recession, is thriving once again, with container shipments up by more than 1,300 percent since 2011. 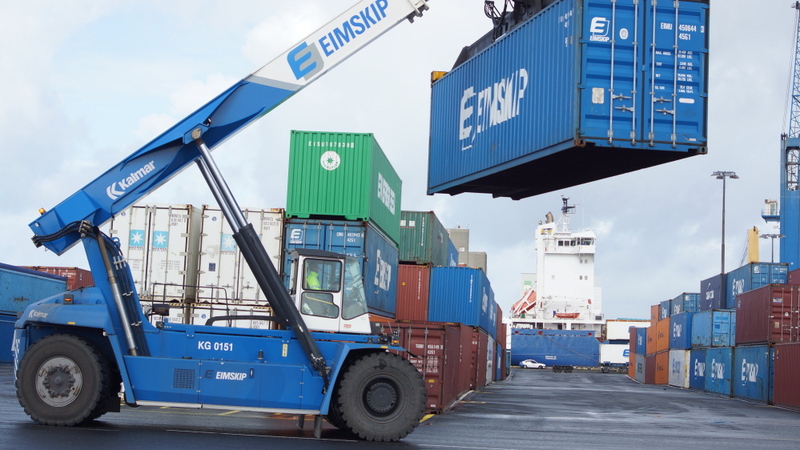 The dramatic increase is largely attributable to Icelandic shipping company Eimskip, the port’s biggest cargo operator, which has grown significantly since arriving in Portland in 2013. 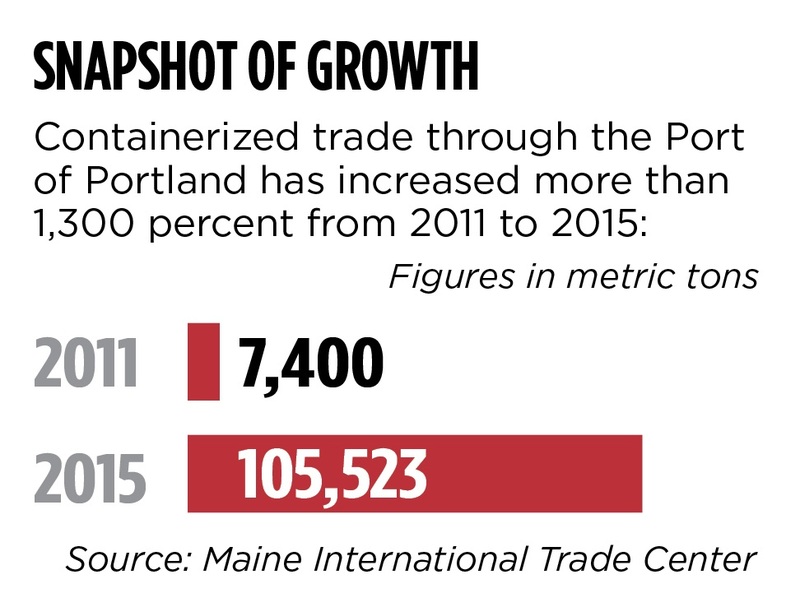 According to the Maine International Trade Center, container shipments through the port have soared from 7,400 metric tons in 2011 to 105,523 metric tons in 2015. • President’s Award: Adrian Kendall, Esq. Increased trade through the port has grown 20 percent, year over year, which “has forced Eimskip to add to our capacity in 2015 and hopefully add to it again in 2016,” Eimskip Managing Director Larus Isfeld told a crowd of 450 gathered Thursday for MITC’s annual Trade Day. The company, which employs 1,300 people worldwide and 10 in its Portland facility, was recognized by MITC as its Foreign Direct Investor for 2016. Isfeld said Eimskip is on track to make its goal of weekly calls to Portland by 2020. When it first opened its Portland operation, Eimskip was making 26 calls a year, but it has added five more since, Isfeld said. The potential for weekly shipments will expand its customer base, which now reaches north into Canada, throughout Massachusetts and is approaching New York City, Isfeld said. He said government improvements to the port – including a crane, a paved space to load, unload and store containers, and the installation of stations where refrigerated cargo units can be plugged in and kept cool – helped Portland compete for Eimskip’s business with ports in Rhode Island and Massachusetts. The investment cost about $30 million. The community’s support and enthusiasm, however, were what finalized the deal, Isfeld said. Eimskip, which ships everything from blueberries to Icelandic glacial water, isn’t the only reason the port is bustling. Two significant investments at the International Marine Terminal also are boosting capacity at the port. One is the completion of a Pan Am rail spur, which now connects the port with a 1,700-mile rail network. 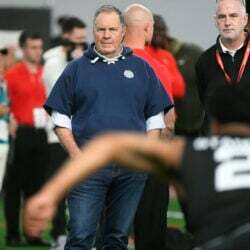 Shipments started in February to Ayer, Massachusetts, three times a week. The other significant investment is the construction of a cold storage warehouse, which is being built by Americold and should be completed by the end of next summer. “All of these point to what I call the ‘intermodalism’ of the terminal, and that positions us for even greater growth,” said John Henshaw, executive director of the Maine Port Authority. Intermodal refers to the juncture of multiple modes of transportation. Henshaw said a new customer has started using the port terminal because of these upgrades. Last month, Poland Spring began shipping bottled water from Kingfield to Waterville and then via rail into South Portland’s Rigby Yard. In January, it started shipping pallets of bottled water from its Hollis operation to the new rail line in Portland. Growth in the port is one reason why Maine’s export numbers outpaced the national average in 2015, said Janine Bisaillon-Cary, MITC’s president. In 2015, Maine exported more than $2.7 billion worth of goods, almost doubling over the past two decades. Maine companies sell products to more than 180 countries and territories. Trade supports about 180,000 jobs here, or about one in five Maine jobs, Bisaillon-Cary said. This story was changed from its original version to correct Larus Isfeld’s title, and a quote about adding capacity. It also has been changed to clarify cargo.